STM7-BSW is a measurement support software for measuring microscopes. Not only is a live image acquired by digital camera and displayed on a monitor, but also observation, measurements and report creation are possible on the same screen. Therefore, the STM7-BSW improves your work efficiency. Measurements are made by receiving coordinates input via STM7. Once measured and calculated, coordinates can be used again for subsequent measurements. This eliminates the need to carry out the same work twice, enabling a smoother and more effi cient workflow. Intersections, central points, lengths,and a range of other measurements can be made by drawing straight lines and circles, which can then be set to remain as reference points on acquired sample images. Both the origin and the X-axis are set with respect to the sample, allowing the sample to be measured even when it’s not aligned with the stage. Conventional measuring microscopes measure the XY plane directly from above. 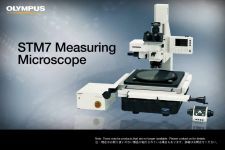 However in response to user demands, Olympus has incorporated an XZ plane measurement function in the STM7-BSW to enable the measurement of crosssections as seen from the side. Now measurements that used to be diffi cult are much easier—such as radius measurements for vertical sections of hemispherical objects, or measurement of the depths of grooves with curved bases compared to a reference line. Frequently used alignment and other measurement procedures can be combined and assigned to a single macro button—eliminating the need to start from scratch each time the microscope is set up. Measurements can be easily repeated based on a recorded workflow by simply inputting the movement of the stage and the coordinates in response to a software prompt. This function can be used to repeatedly carry out the same measurement on the same sample, or diff erent versions of the same sample. Furthermore, if a set value and tolerance are set in the recorded workfl ow, the software can automatically identify when a measurement has failed. This function displays the direction and distance to the next measurement point, thereby eliminating any confusion on the part of the operator. The function additionally eliminates the need to check the next measurement point on the diagram each time, speeding the operator’s workflow through a series of repeated measurements. This function detects the edges of the sample and automatically acquires and measures its coordinates. As a result, operators no longer need to designate the coordinates and subjectivity is minimized. Automatic Edge Detection also features a timer function that enables coordinates to be acquired in a specified time and supports the use of a foot switch that enables the operator to focus on measurement operations without taking his or her hands off the stage handles. Metal burrs and other abnormal points can be excluded automatically during edge detection. This enables a consistent calculation of measured values, irrespective of the state of the sample. Points excluded as abnormal can also be displayed on the screen in diff erent colors. The light intensity of the microscope can be maintained by accurate software control. Light intensity settings can also be saved when recording a workfl ow for replay measurement, enabling measurements to be made under the same conditions during replay measurements or automatic edge detection. Through use of the coded revolving nosepiece, previously set calibration values are automatically recalled when changing the objective. In this way, the user can always be confi dent that the proper scale is on display. Measurement results can be output in Excel format with a single click, eliminating mistakes made during transcription. Images can also be pasted in along with the measurement results, enabling more effi cient report generation. Tile multiple images to capture a single high-magnifi cation, wide-area image. Because the images are tiled on the basis of coordinate data, the system is capable of producing highly reliable images. The EFI function is eff ective for obtaining images that are well-focused throughout on samples with an uneven, complex surface shape. Generate a single image with focal points aligned in all positions. Simply process multiple images with diff erent focal point positions while moving the Z-axis, or use the motorized model for automated image composition. * Microsoft Office 32bit 2010/2013/2016 are also supported.